When IFB latest project-Spring-Summer Break Packing List-asked us to plan for a perfect spring break, I could not think of a better place than Goa. Know as the ‘The Rome of the East’, Goa is the fave holiday/wedding/party/chilling-out/escape destination of India. Its frolicking beaches, the balmy tropical weather, the lovely costal landscape, the decadently delicious cuisine and a wonderfully mixed Indo-Portuguese culture is every beach lover’s happy place. For someone who prefers the warm climate to the cold ones, Goa is my dream spring-summer break destination. Here’s the deal, I have never been to Goa (I think I heard a collective gasp by the die-hard Goa frequenters and lovers). Goa is one place that has been on my wish list for years. One of my must-do in 2012 is spend a glorious week on this beautiful paradise. But till then, a girl can dream! I can actually imagine taking a dip in the beautiful Arabian Sea, spending lazy afternoons reading my fave rom-com on the beach, or shopping at the local flea market finally ending the day with a sumptuous dinner of butter garlic lobster before hitting a beach party. *Sigh* Hopefully, some day soon! What is your ideal spring-summer break destination? Are you a beach lover like me or do you prefer a cool countryside getaway? Do share your spring break stories with me in the comment section. Oooh..love the 2nd outfit! A maxi dress and flip flops and a big floppy hat is perfect beach town strolls!! Great post Amena! Hope you are having a wonderful day! 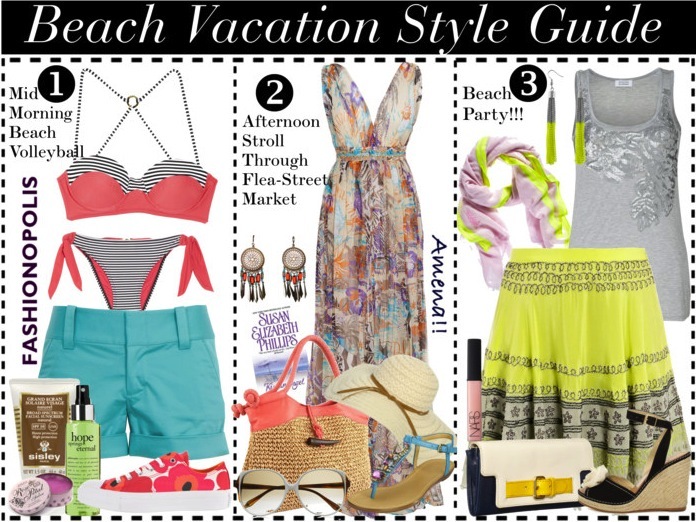 I love that second dress, and now I want to go on vacation too! omg beach sounds so good..sunset in a beach, a little picnic with the loved ones..ah..i am actually thinking of going to las vegas in summer, hopefully it will happen soon. take care.